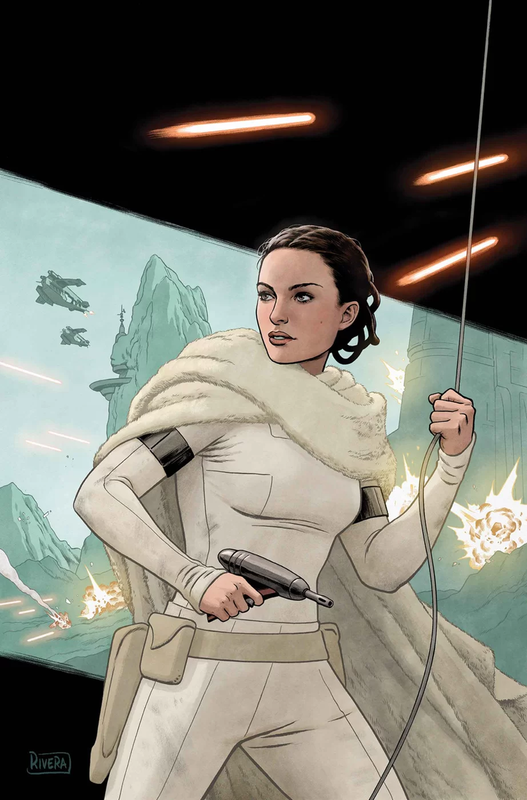 Padme Amidala #1 is a nice little adventure story with Padme and a couple of her handmaidens as they go off on a diplomatic mission to gain some new allies for the Republic. Of course there’s trouble, and Padme takes action to deal with it. Nothing groundbreaking, but it’s enjoyable. The issue starts off on Coruscant with Padme and Anakin walking around the senate corridors. They share a moment together, then Padme is off with Dorme and Motee as they head for Clabron. They’re met by an assassin. Things unfold, Padme learns what the situation is, and she ends up dealing with the assassin and striking a deal with the grand minister of Clabron. It’s not an overly complicated story, and it’s a bit simplified in order to all fit in one issue. For instance the assassin strikes from the roof top with impunity until Padme goes up there and takes them out. Apparently Clabron’s security forces couldn’t even achieve that, though you wouldn’t know they had any by reading this issue as they’re no where to be seen. The artwork is pretty good and does a good job of handling the characters and the action. The alien species for Clabron is a new one, and it’s, well, it’s not the most Star Wars species we’ve seen but I guess it’s okay. There’s a nice moment the comic focuses on between Anakin and Padme, which is probably the artists highlight of the issue. Overall, not too bad, but nothing too stellar. It gets the job done and it’s enjoyable. I give it a three out of five metal bikinis.